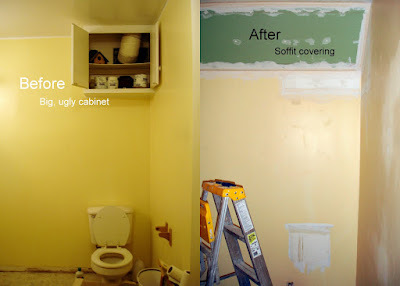 The Bathroom Re-Do continues. Over the weekend the bathroom was basically gutted. We took out the tub, sink, cabinets, toilet, medicine cabinets, old flooring... EVERYTHING! It looks like a blank canvas just waiting to be filled. Wes has been working on the tub plumbing. We are going from two separate knobs to a central knob. One of the best things we are doing is raising the shower head. The kids complained for years about being able to wash their hair with the head being so low. Now that they are all grown, and TALL, we think we will go ahead and raise it up a few inches. The new tub enclosure doesn't come already with a hole, so we can decide and make the hole ourselves. We picked up a shower curtain bar that is curved to give you more arm room too. It's going to be nice. If we have the money, we are going to add a tiled section around the tub enclosure too. We were looking at the tub enclosure yesterday at Home Depot and wouldn't you know it's on the same aisle as the potty's. They are so reasonable, I think I've convinced Wes to get a new one of those too. Everything will be brand spankin' new. Hurrah! I'm getting a few moments to myself this morning. Had to have my lab work done for an upcoming appointment and I asked Wes if he would mind watching Scott for about an hour and he said, "Go For It!" So, I'm catching up on e-mail, blogs and making some future plans for next year while enjoying a Chai Tea at Starbucks. We all need to prepare for those New Year's Resolutions right?